How about a home security upgrade? 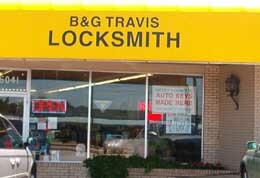 At B&G Travis Lock and Key, we specialize in taking special care of all our customers, both residential and commercial. We sell and service all types of locks and door hardware. We also sell and service Safes. All of our locksmiths have been licensed according to OK state law!